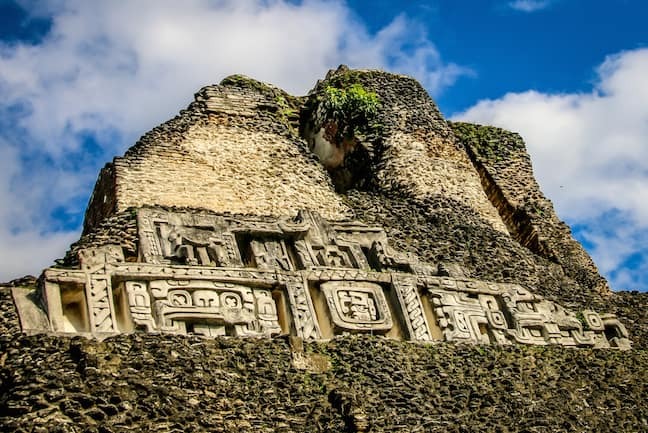 There is a private ritual I have– sacred and, until now, unspoken– that helps me connect with ancient archaeological sites such as the Xunantunich Mayan ruins in Belize on a more personal (rather than academic) level. First, I consider the nature of time and human evolution. In 2015 a story was published in Science about the discovery of a fossilized mandible of an early human that lived around 2.8 million years ago in the Afar region of Ethiopia. Think about that: 2.8 MILLION YEARS! In that context, the 1300 years that have passed since the Mayans constructed the city of Xunantunich is merely the blink of an eye. Secondly, if we’re with a guide or tour group, I will often use photography as an excuse to distance myself from the pre-packaged experience, intentionally tuning out everything around me. I try to envision the city as it was 1200 years ago, bustling with activity as the Belize Valley region’s top Maya civic ceremonial center. Lastly, I imagine the reverence local residents must have felt as they gazed up at the pyramid known as “El Castillo” (the second tallest structure in Belize, at 130 feet). I do my best to ignore our modern world of computers, cars, and cell phones, so that I can try to explore the Mayan ruins of Xunantunich through the eyes of someone from the Late and Terminal Classic eras. Xunantunich is located on top of a ridge above the Mopan River, about 80 miles west of Belize City in the Cayo District. You have to take a short ride (50-60 feet) on a hand-cranked ferry across the river to get to the site, which is located just one kilometer east of the Guatemalan border. But the ferry is free (even if you self-drive), and the entrance free to see the ancient Mayan ruins is just 10 BZD ($4.98). There’s evidence to suggest the city was settled as early as the ceramic phase of the Preclassic period, which lasted from around 1000 BC to 400 AD. 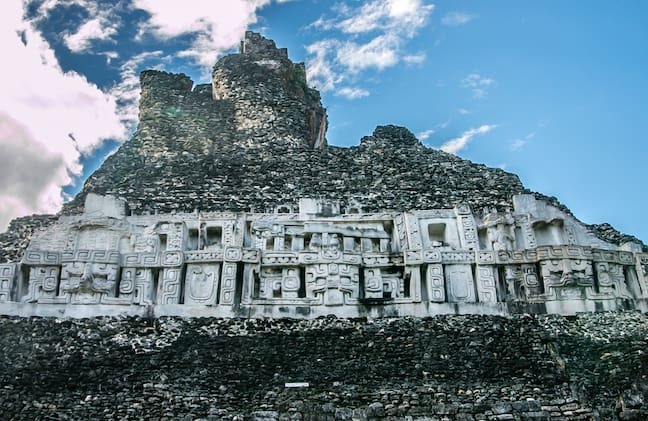 But it wasn’t until Xunantunich established a political connection with the nearby city of Naranjo (in Guatemala’s Petén Basin) sometime between 670 and 750 AD that it really began to grow. Compared to some of the other major Mayan sites, the history of Xunantunich is relatively short in terms of human habitation. Archaeologists believe that construction of the main buildings began around 800 AD, just as Naranjo and other Mayan civilizations were beginning to crumble. Some have suggested that Xunantunich’s hilltop location gave it a strategic advantage, making it much easier to defend. The core city– which includes six plazas, more than two dozens palaces and temples, pok ta pok ball courts, and hundreds of mounds that are still yet to be unearthed– is around one square mile and made from limestone rock raised from the ridge upon which it sits. But it’s surrounded by fertile farmland that once contained villages divided into family groups, all of which were economically self-sufficient. Some historians have theorized that Xunantunich grew rapidly after Naranjo faltered, as suggested by the major construction efforts on Structure Al, the Castillo (Str. A6), and other buildings. But the last date officially recorded at Xunantunich (on Stela 9) is 830AD. Though building activity continued into the Early Postclassic period (AD 900-1000), the pace of growth slowed dramatically. There is evidence to suggest that the inhabitants during this era may actually have been smaller groups who moved in after the Mayan residents had abandoned Xunantunich altogether. 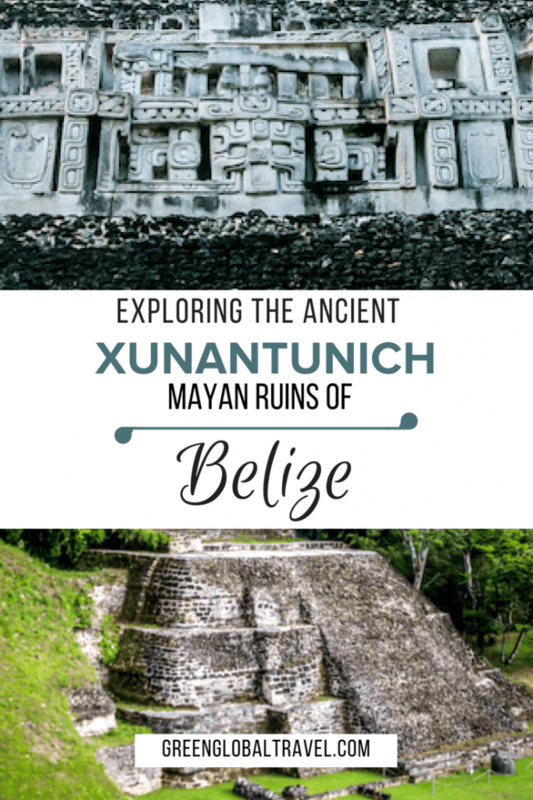 The name Xunantunich was taken from the Yucatec Maya words for “stone sculpture of a noble lady.” According to local folklore, a man from a nearby village was hunting at the site in the 1890s. As he passed El Castillo, he was awestruck by a beautiful woman in traditional Mayan clothing standing in the mouth of a cave. Others later claimed to have seen her, but no one could ever find her in the cavern. 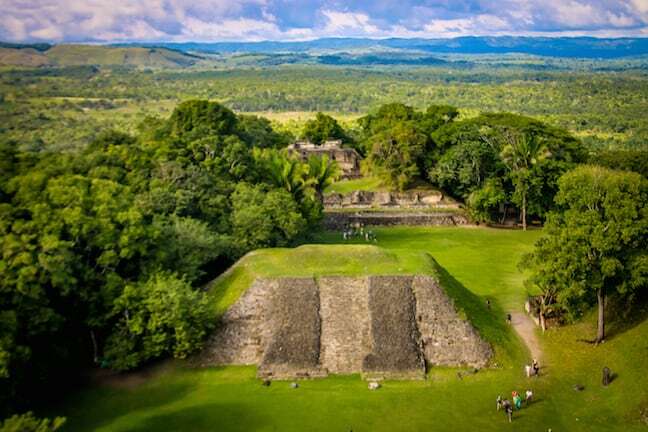 A relatively minor satellite city for the Maya empire, Xunantunich remained largely unknown to the outside world until Irish surgeon Thomas Gann became Cayo district commissioner for what was then known as British Honduras in 1892. He chose the area specifically because of his keen budding interest in Mayan archaeology. Gann and his successor, Sir J. Eric S. Thompson, were the first westerners to document detailed descriptions of the local Mayan ruins and establish the region’s ceramic chronology, co-publishing The History of the Maya from the Earliest Times to the Present Day in 1931. The main excavation began in 1959 by a Cambridge team led by Euan MacKie. MacKie was an expert in the field of Archaeoastronomy, which examines how ancient civilizations understood astronomical phenomena, how that understanding influenced the design of their cities, and what role the stars and planets played in ancient cultures. MacKie discovered that the layout of Xunantunich was very similar to that of Naranjo, and found ample evidence of communication and trade with other Mayan sites. He and his team excavated numerous structures, including the upper building on Structure A-11 in Group B and a residential structure, A-15, that’s located right outside the main complex. Mackie also deduced from structural damage to El Castillo that the city was destroyed by a sudden disaster– most likely an earthquake– at the end of the Classic period (around 900 AD). 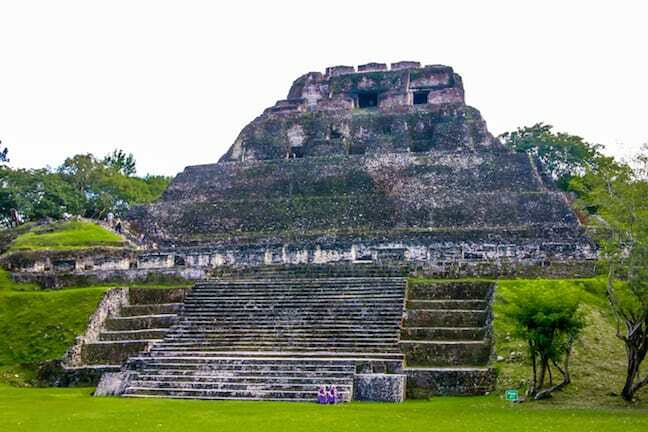 Subsequent archaeological teams to do in-depth research on Xunantunich and other Mayan sites nearby include the Xunantunich Archaeological Project (XAP) and the Xunantunich Settlement Survey (XSS). As we walked around the ancient city with our guide, who related much of this fascinating history, I found my consciousness drifting. We entered one of the smaller buildings– a meeting room likely owned by a merchant from the city’s ruling family. I could picture the men sitting on the wide stone benches discussing the business of the day, and the beloved ancestors buried in the small tombs (an honor in an era when all but the most wealthy people were cremated). 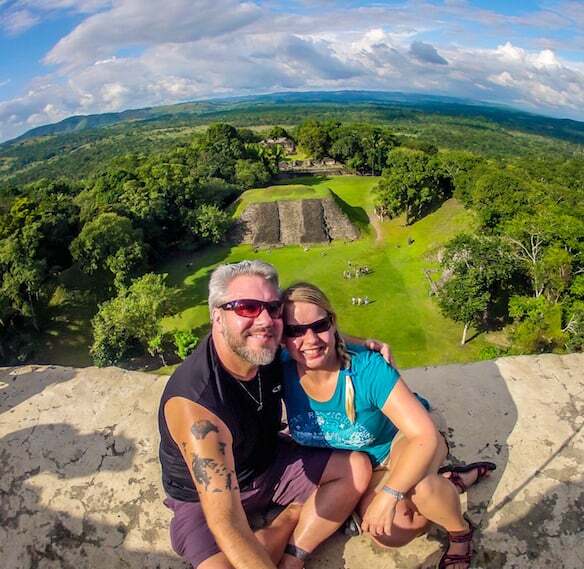 As we climbed to the top of a two-story ruin to get a stunning view of El Castillo, I could envision the plaza crowded with people shopping for produce, fresh fish, and meats from the nearby farms. I could imagine artisans hard at work carving intricate friezes, crowds loudly cheering players of intense pok ta pok ball games, and the wealth and power represented by these temples and palaces in their prime. I could feel this ancient energy coursing through my veins as we climbed the steep steps of El Castillo, huffing and puffing our way past young Mennonite girls in vivid purple dresses, a small group of German teens, and a much larger tour group of Australians (who, thankfully, were coming down as we were going up). As we paused to let them pass, we got a close-up view of the massive friezes carved into the sides of the pyramid. These depict the birth of a god associated with the royal family, the Mayan gods of creation, and the sacred Tree of Life. My mind boggles at the incredible detail of their ancient artistry, and the time, effort, and skill involved in creating these 1200-year-old masterpieces. Needless to say, the view from the top of El Castillo was spectacularly scenic, with the hilltop ruins giving way to thousands of acres of green space and the mountains of Guatemala visible in the distance. We timed it perfectly so that there were just a handful of other people savoring the view from the summit with us. It was a huge change from the thousands of travelers who descended upon Chichen Itza on the day we visited back in 2013. It gave us plenty of time and space to enjoy the moment, savoring the gorgeous scenery and snapping a few obligatory selfies. Xunantunich isn’t nearly as expansive as some of the other Mayan sites we’ve visited, including Tulum, Coba, and Caracol. It’s not as significant to Mayan history as Chichen Itza or Tikal, and is typically considered a quick stop en route to the latter (which is located 65 miles away in Guatemala). But we found it to be equally impressive to those more famous sites, thanks to its small crowds, and gorgeous friezes and stela that provide intriguing insights into a lesser-known center of ancient Mayan culture. It’s one of the few Mayan sites left where visitors can still climb the primary pyramid, and provides a perfect opportunity to imagine how life in Central America must have looked 1200 years ago. 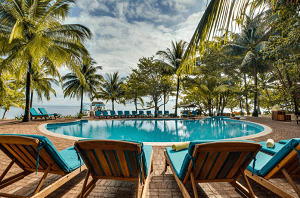 Jaguar Reef Lodge & Spa– Another of the highest-rated places in the Hopkins Village area, this luxury resort truly makes the most of its lovely location. 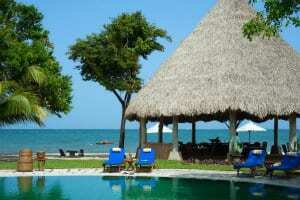 The beachfront bungalows are beautiful and spacious: Some even offer private jacuzzis on the patio. 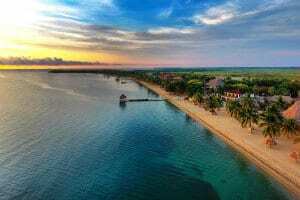 The staff is notoriously warm and welcoming, with two pools, a spa, and a quality restaurant on site. 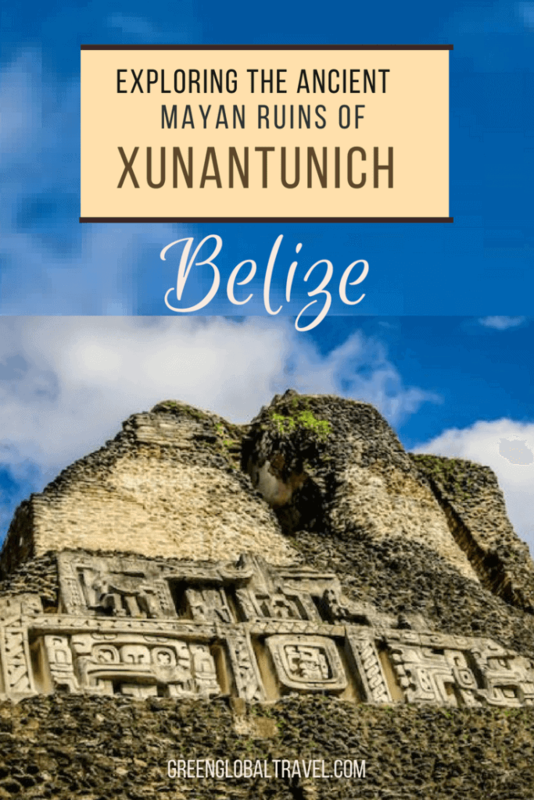 They also offer tours to most of Belize’s ecotourism hotspots, including Xunatunich, the ATM Cave, Cockscomb Basin Wildlife Sanctuary, the Belize Barrier Reef, a Mayan chocolate farm, and more. Check Rates or Read Reviews. Our Belize trip was sponsored by San Ignacio Resort Hotel and the Belize Tourism Board. But we will never compromise our obligation to be truthful to our readers.